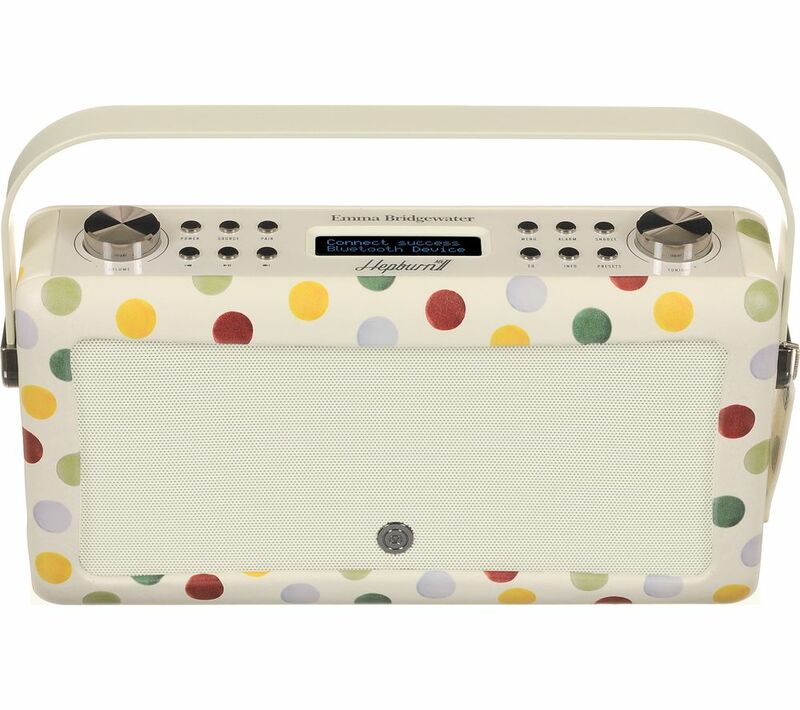 Listen to news, views, sports, music and much more on the Emma Bridgewater VQ Hepburn Mk II Portable DAB+/FM Bluetooth Radio. Enjoy access to an unlimited range of digital and analogue stations across the UK and Europe. Select from popular pre-set stations or discover your own niche programs. Take the portable radio on picnics in the park or to relax by the sea. Wherever you listen to your VQ Hepburn Mk II, the vintage design, and exciting colours and patterns will be noticed. Embellished with quality leatherette, this radio compliments any interior décor. In addition to the endless list of radio stations, you can connect your smartphone, tablet or MP3 player to the Mk II Portable DAB+/FM Radio's Bluetooth speakers to enjoy your own playlists and streaming services such as Spotify. Plug your CD player into the 3.5 mm aux input or USB charging port for even more music options. The VQ App lets you control the radio's functionality with your Android or iOS phone. With your entire listening experience in the palm of your hands, you can control your radio from the other side of the room. I really like the layout and design of the radio. The nobs for volume and tuning is my favourite and is better than push buttons that are on other radios. The sound output is great for such a small radio. Storing your presents was tricky at first but once you managed to work it out it was relatively simple. Looks good great colour great style. Not loud enough. I work in a very noisy environment. I took this to work turned it on full volume and couldn't hear a thing. Which is why I took it back the next day and changed it. If it had been just to use in my house it would have been fine. That's the only reason I've given it a low rating because it wasn't suitable for what I needed.